Lysander Mk.I из 239-го дивизиона Королевских ВВС Великобритании, 1941г. Lysander Mk.I из 1-го дивизиона связи Королевских ВВС Египта, 1940-1941г. Lysander Mk.II из 20-го дивизиона Королевских ВВС Великобритании, 1942г. Westland Lysander II L4767 was delivered at the end of 1939 and in the markings shown here was operated by No 13 Squadron, which served in France until May 1940. Subsequently, L4767 was used by No 7 AACU and No 2 Squadron before transfer to the Indian Air Force. Lysander III R9125 was one of a 100-aircraft production batch delivered in July and August 1940, and served first with No 225 Squadron as shown here. It was later converted to a target tug. Starting in August 1941, the Indian Air Force received Lysanders transferred from the RAF. They were operated initially by No 1 Squadron, IAF, and subsequently by Nos 2 and 4 Squadrons, with a few also used by No 22 AA Unit for target-towing. Lysander Mk.II из авиагруппы "Бретань" ВВС "Свободной Франции", аэродром "Зуар" (Чад), январь 1942г. Lysander Mk.II французских ВВС, испытательный центр "Эвиль", 1939г. Lysander Mk.II из 1-й эскадрильи Ирландского Воздушного Корпуса, 1942г. Westland Lysander II at Yesilkoy, 1940. The Turkish Air Force was one of several pre-war customers for the Lysander, ordering 36 Mk IIs in 1939. They were delivered in February/March 1940 and No 3130 was in service at Yesilkoy in that year. Снятые с фронта на Европейском ТВД, "Lizzie" приняли активное участие в тайных операциях, где пригодились их отличные взлетно-посадочные характеристики. На рисунке - самолет из 161-й эскадрильи специального назначения. Lysander IIIA V9367, delivered from the Westland Yeovil assembly lines early in 1943, served only with No 161 Squadron - the second of the RAF's Special Duties units - being written off at Tangmere on 17 December 1943. Note the long access ladder of the SD Lysander. 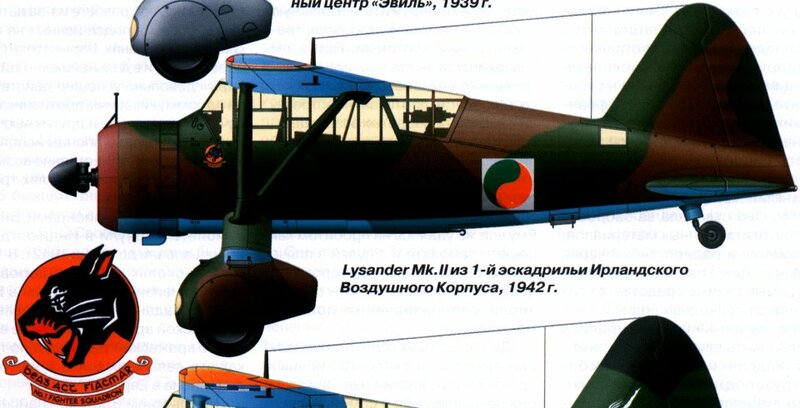 Lysander Mk.III из 2-й эскадрильи 18-го авиаполка (2/LeLv.16) ВВС Финляндии, 1942г. Lysander Mk.II - буксировщик воздушных мишеней из 8-й школы бомбардировки и воздушной стрельбы (Bombing and Air Gunnery School) Королевских канадских ВВС, 1942-44гг.